Our minister is Rev'd Geoffrey Farrar. He is minister of our church, and the nearby Methodist churches at Barnes and Roehampton, all part of the Richmond & Hounslow Circuit. Before coming to us, he served in Watford and Bushey in the West Hertfordshire & Borders Circuit of the Methodist Church. 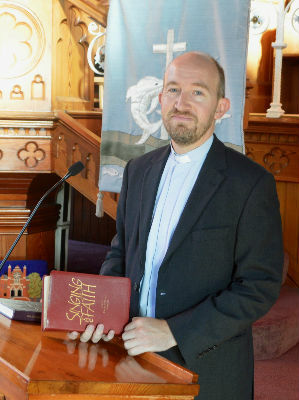 He trained at Wesley House in Cambridge and was ordained in 2012. Before this he was a civil servant, working at the House of Commons, and an English teacher in Poland and China. He entered into a civil partnership in 2011, and both he and his partner are really enjoying getting to know Putney. To e-mail Geoffrey, please click here. Or telephone 020 8789 9722.